Step aboard the USS Enterpaws! If you're a Star Trek fan, then by golly your cat sure better be a Star Trek cat! Not an alien cat, or anything like that, more so just a cat that also likesStar Trek . . . or at least appears to like Star Trek . . . 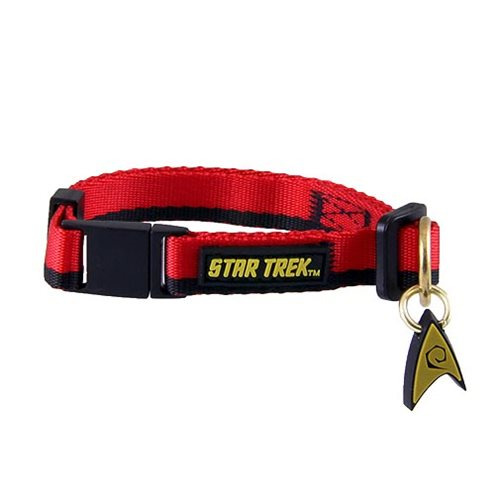 In any case, whether your cat is a legit fan or just a poser reppin' the Star Trek logo to impress his / her friends, this Star Trek: The Original Series Red Uniform Cat Collar is a must-have. Oh no! Your cat is a red shirt. Luckily kitties got nine lives, right?